As the weather starts to warm up our attention shifts to cleaning up and starting up our water supply’s outside. This involves most likely turning on the outside faucet for the first time since last fall. Some of us will get an inopportune emergency….The outside faucet has a crack or broken pipe. It may be visible or not. This may happen if a hose was not removed and water was trapped and froze. If this happens you may experience low water pressure as you are washing out the garage or rinsing off the drive way. If this is the case you should turn off the outside faucet immediately and go and investigate!! You may have a break in the line and water may be spraying everywhere or running down a wall behind the drywall. Either way, call Micro Plumbing, Inc. immediately and we will get your water back on and running properly. Prevention is the first line in home defense of damages. Be aware of possibilities when first starting up for the new season!! 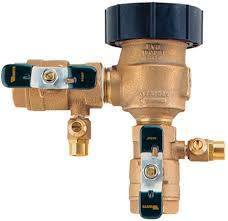 The same goes for the Backflow Preventer Valves for underground sprinklers and pools. Watch for breaks, cracks, or leaks when you start up your systems. If the system was not shut down or the main shut off did not close properly, this is a very common area for a source of a leak. Sometimes you can see it and sometimes it takes time for it to show up. Either way be watchful and mindful on these nice days that are coming as we are working in our yards and are preparing ourselves for the warm months ahead. Some backflows do require annual testing for pools and sprinklers so be sure to get your backflow scheduled for testing and beat the rush. Micro Plumbing, Inc. is available and here for you!! Remember, “Big or Small, We Do IT All! !” Give us a call 402-895-1212.